It’s been 14 years since we saw our favorite family of Supers watch The Underminer pierce through the Earth’s surface to pose a new threat for The Incredibles… This beloved Pixar film is typically among the top three when people list their favorites… So the buzz behind the sequel was huge! 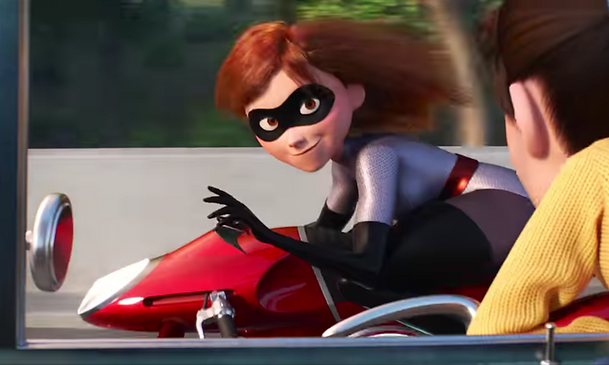 I headed out, on opening day, to the new Alamo Drafthouse – Raleigh to see Incredibles 2, where the pre-show included a fantastic “Why We Love Pixar” short film, and a “Previously on The Incredibles” recap for the pre-show. With popcorn and drinks ready to go, I was excited for the film to start! First things first, one of my favorite moments of any Pixar film is the remarkable short films, shown before each film. These shorts always sweep during awards season for being beautifully animated and heartwarming. From Piper to La Luna, Lava to Lou… For a few minutes you’re transported to a delightful story, and leave falling in love with the characters. So that brings us to the newest addition to Pixar’s short film legacy, Bao. I won’t go into any details, to not spoil you… But let’s just say, I was left both confused and disappointed. This was, to put it mildly, a very odd short. Very odd indeed. But I’ll let you be your own judge! You may absolutely love it. After we got through the “interesting” short, it was time for the moment we’ve been waiting a decade and a half for! The whole theatre was buzzing in excitement! I have to say, this one was worth the wait. This was as fun of a ride as the first, with epic action sequences, hilarious parenting moments, new Supers, and a great villain! And of course, everyone’s favorite designer returns! One of the great plot points of this film is the power of women. While Mr. Incredible is usually considered the strongest of Superheros, it’s recognized that to improve the “brand” of Supers with the world and allow them to come out of hiding, that Elastagirl will be the best choice. Her strength combined with a calm head is valued, and her husband stays behind with the three children while she heads off to rid the world of an evil new villain. Of course, while she is away, we get to watch Bob Parr in full-on Dad-Mode. From “new-math”, to teenage boy troubles, to a baby who literally bursts into flames and turns into a demon… This is no easy task. Jack-Jack steals the show throughout most of the movie, with his powers that make him both terrifying and adorable. In addition to the Incredible Family, we also see a return of Edna Mode and Frozone, and some additions of brand new Supers and Villains. Overall, I am giving this film some serious high-praise, worthy of the original. One reason I truly love The Incredibles and now, Incredibles 2 is the design of the film. Though futuristic, the entire film has a Mid-Century design. The Jetsons is what immediately comes to mind. A great, 1960’s look into what the future was expected to look like. In this film, the Parrs move into a gorgeous mountain-side home that gives all the mid-century, concept-home vibes. If I could move in tomorrow, I would! One note, as I was watching, there was a scene that truly surprised me, and I was not shocked to arrive home to find a lot of “warnings” being shared about it. There is a 2-minute scene, as well as a few other several-second scenes that feature black and white, rapid flashing lights. In the longer scene, the entire screen is flashing the whole length of that time. In a pitch-dark theatre, you can imagine the consequences of such a moment. If you, or your little one, has photo-sensitive induced seizures, headaches, migraines, or sensory processing issues, this may be a huge issue for you or them. I highly recommend a prior viewing by a parent or friend who is familiar with your specific issues to determine if this is safe for you or your kiddo to view. Personally, I was very shocked that this scene made it into the film. As someone who doesn’t have to deal with any of these issues, it still was my immediate thought when the lights started flashing. And even though the scene was beautifully animated in a new, very different way, I still left surprised at that moment. I worried for all those who saw the film before the Social-Media warnings starting showing up. By Saturday, warnings were posted on Theatre Doors letting guests know of the issue. What is the best age to start going to Disney?